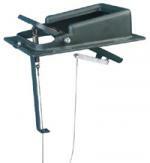 Stop the energy thief...your fireplace damper Traditional fireplace dampers leak. They leak a lot. That costs you big money in lost utility dollars going out your chimney. A Lyemance Top-Sealing Damper will change all that. This well constructed, superbly engineered damper eliminates 90% of the winter heat and summer cooling loss that leaks past your current damper. It also eliminates downdrafts and keeps moisture and animals out of your chimney and home. Moisture in your chimney causes unwelcome odors and leads to deterioration of bricks and mortar. The Lyemance Top-Sealing Damper works year round to protect your chimney. The silicone rubber gasket (included) provides solid, tight-sealing protection to the top of the flue. Traditional throat dampers only give metal to metal contact - notoriously leaky and expensive. Who can afford heated or cooled air going out their chimney?The lyemance damper is operated by a 35' cable dropped down the chimney with a handle mounted in the firebox (Both Included). Just a tug on the handle will open or tightly close the Lyemance damper. EASY TO INSTALL / BEST PRICE GUARANTEE / FREE SHIPPING All of our fireplace dampers are easy to install and are easy to remove for cleaning. In the case of the lock top chimney dampers, it's recommended that you order the sweeps rings for easy removal and cleaning. For those with round flues, an RS adaptor will make it easier to clean your chimney dampers. The Lock Top II chimney dampers/caps includes the sweeps ring. The Lock-Top II combines the engergy-saving features of the Lock-Top Damper with a special stainlesss steel Gelco chimney cap. The Lock-top II comes fully assembleld. The base mounts to the included sweep's ring which attaches to the flue with silicone sealant which is also included. A 30' stainless steel cable (included) drops down the flue, and a hardware set (included) mounts in the firebox. The Lock-top II has a lifetime warranty and is available in 3/4" and 5/8" mesh. The Lyemance top sealing chimney dampers have a low profile and swing down into the flue. We also offer the lyemance damper with a specialized fitted cap. 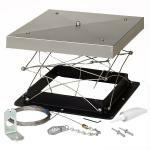 The functionality and ease of use of our top mount chimney dampers are important features which add to their value. The fact that our top sealing chimney dampers are securely attached with a silicon, watertight adhesive is one of the many features that makes this chimney damper a superior and reliable chimney product. Top Sealing Dampers are attached to the top of the flue with a silicon, watertight adhesive. 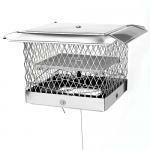 They are operated by a steel cable down the inside of the flue, which is attached to a handle mounted to the side of the fireplace wall. (All of this is included with your chimney damper purchase) For round flues use the lock top chimney damper with an RS adaptor. 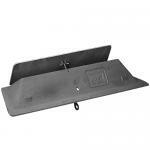 We also carry traditional bottom cast iron fireplace dampers. We guarantee all of our prices and all of our dampers ship fast and for free. Why buy anywhere else ? Any questions, feel free to call 1-888-320-4786. © 2019 Fireplace Essentials. All Rights Reserved.